Tiger in a Tropical Storm was the first painting that Rousseau painted in his signature jungle scene in a dream-like style. The painting was first rejected by the salon show but was exhibited at a non-juried show where it received mixed reviews. Henri was a self-taught painter and his naivete was not favored by critics, although he was admired by artists looking to break away from the traditional art establishment. The painting was actually quite large at over 5" wide. Rousseau captures a surreal dream quality in his work from a wide range of resources that fueled his imagination, such as French gardens, museums and books. The painting is so detailed in it's lush, tropical foliage with a sophisticated use of color and brushwork that it transcends the 'childish' label from critics. 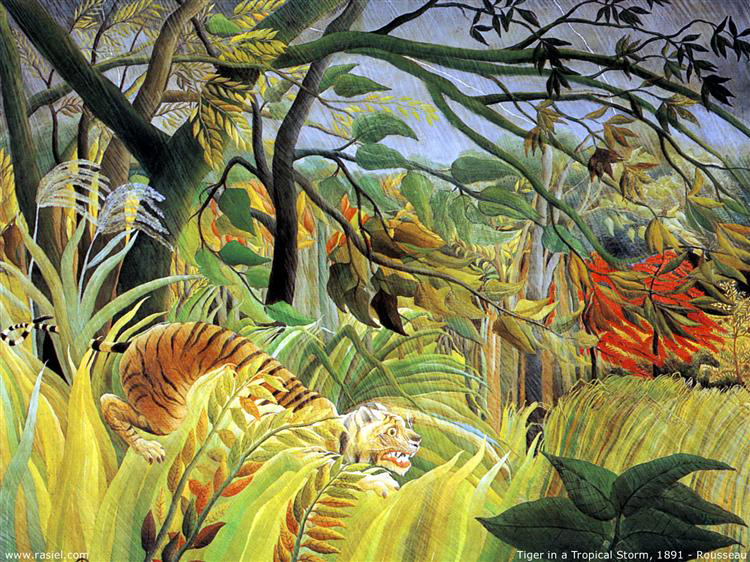 The subject of the tiger is ready to pounce on an unseen prey, leaving the story to the viewer and inviting us into Henri's daydream of a dangerous and wild jungle. "As a self-taught painter, Henri Rousseau was completely untrained in any established art techniques. He is best known for his naïve, or primitive, childlike jungle scenes. He was good at painting and music as a child, but spent most of his life in the profession of a customs officer at the outskirts of town. He started painting seriously at the age of forty and by the time he was 49 he retired from his job in order to paint full time. Although the painting establishment laughed and ridiculed his artistic style, he was highly regarded by artists who were outside the establishment, such as Picasso, Jean Hugo, Leger, Beckman, and later, painters of the Surrealist style. His artistic contributions and place in art history were mostly noted after his death. From 1986 until 1908 Henri exhibited his work yearly with growing recognition but wasn't celebrated until Picasso discovered his work and held a banquet in his honor. During this time he exhibited with the Fauves (Wild Beasts) such as Henri Matisse, although Rousseau is more noted at an outsider artist due to his lack of training. Please visit us Saturday to see the prizes! Please add the tag or title JULY ABS to your photos. Include a short description, who created the art beads and a link to your blog, if you have one. 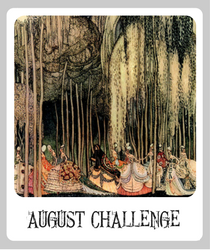 • The Monthly Challenge Recap with Blog Tour will be posted on July 31st. • Winners will be randomly chosen from all the qualifying entries on August 1st.